If the Academy Award nominations tell us anything, which they probably don't, it's that there is no denying that comic book based movies are far from the niche titles they were many years ago and are evaluated on par with other films. Black Panther is a deserving nominee for Best Picture and I hope that Spider-man into the Spiderverse rides its Golden Globe to another piece of hardware. As I reflect on the movies I saw in 2018 I am not sure that any movies had a greater impact on me than those two. Guardians of the Galaxy #1 - I was initially going to pass on this title until I saw that Donny Cates was writing the first arc at a minimum. I am definitely happy that I saw the tweet as he is taking over at an interesting time for the Guardians. Thanos is dead and just announced, via a hologram, that his conscious has been transferred into another being. There is some Voldemort type of action going on here as the Mad Titan took severe measures to ensure he could cheat death. There is a mad scramble to figure out and kill that individual. He or she must be strong enough and capable enough to survive the process and it is unclear who it is, but it is likely someone we all know. 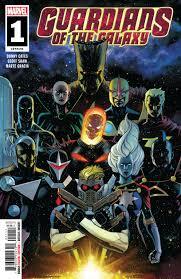 The Guardians are dealing with their own issues when The Black Order steals Thanos' body. This was a phenomenal debut and I am very anxious to see who is in possession of Thanos' head and also intrigued by the artistic choice to have Groot speak in a manner we can all understand. No more "I am Groot" and I am somehow ok with this choice. Star Wars #60 - After summoning help to the moon of Hubin, Luke has unwittingly alerted the Empire to his location and brought the Scar Squadron to the surface. The Scar Squadron, an elite group of stormtroopers, is led by the light saber wielding Kreel. The leader of Hubin is not happy with this development and forces Luke and Kreel to duel to the death. Much like when Harry faced Voldemort in the graveyard, Luke knew a quick escape was better than a confrontation at this time. His brave actions impressed the ruler's daughter and enabled the people of Hubin to understand that the Rebellion was a force of good in the universe. I am not sure what to make of the last panel, but it looks like the escape might not be going as good as Luke and company realize. Man Without Fear #4 - We are nearing the end of Matt Murdock's stay in the hospital and learned more about the confrontation that put him there thanks to an unpleasant visit from Kingpin. Since we are on a Harry Potter reference kick, Murdock laying motionless and forced to listen to what Kingpin said reminded me of Harry petrified on the Hogwarts express taunted by Malfoy. I was surprised to see how much snow threw off Daredevil's radar, but it makes sense and the tension of Kingpin gloating over Murdock pretending to sleep was glorious. This has been an odd mini-series, but one that is well worth checking out if you are a Daredevil fan.